As a busy entrepreneur leading a growing but remote team, I’m starting to discover my “let’s just wing it!” content and marketing methods just aren’t going to cut it any longer. To borrow from another phrase, we’ve been “posting and praying” since 2010 and it’s just not effective way to run an organization. What GuysGirl needed was streamlined methods to manage multiple editorial calendars, plan social content and track the effectiveness of those efforts. For years, we’ve used a combination of spreadsheets and emails to keep our content somewhat under control. We were tracking page views with Google Analytics and posting social updates through Hootsuite, but we haven’t been able to bring all of those programs together. As GuysGirl continues to grow the editorial team, we’re also growing our media team who handles content, editorial strategy and distribution for other brands. Which is why I knew we needed to lay the groundwork for an expanding team as 2016 draws near. After months of annoying my team to try out various platforms, we made the decision to go with CoSchedule. Because we can handle the major aspects of creating great content, planning our editorial strategies for various brands, social media promotions and tracking which content performs the best—all in one location. Syncs with WordPress so while logged into WP, you can promote the post socially as soon as you hit publish. 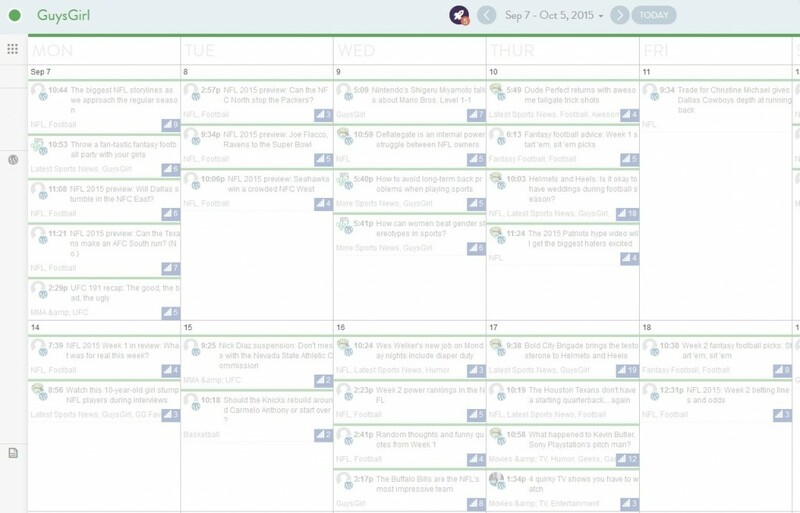 When you login to CoSchedule, the main calendar view shows your articles and social posts at a glance. You can link other platforms to CoSchedule such as Google Docs, Google Analytics and my personal favorite, Evernote. The social promotion is one of the biggest aspects that sold me on CoSchedule. In your calendar, you can click a post and brings up an action box where you can schedule as many social messages across various platforms as your heart desires. Here is where you can change up the messaging so you’re not giving readers the same article title over and over and hoping they click to read. You can easily check which posts are performing the best. In this area you can also see which posts need a bit more social love and schedule your messaging appropriately. One of my other favorite features is to see at a moment’s glance the top performing post, per writer. It can be difficult as a growing team to allocate resources to helping to mold young writers but it’s also vital to the success of any website. Therefore using this tool can help me quickly show a writer where they went right and where they need a bit more improvement. This helps both the readers of GuysGirl get the content they resonate with the most while also helping our writers grow stronger in their own skill sets—both of which I’m extremely passionate about. If you’re a reader of GuysGirl, you may be asking yourself, “Why do I care what software you use?” To which I would say this addition for GuysGirl means we can quickly and easily see which content you, the readers, are enjoying the most. And we can see which content you frankly don’t care about. Knowing this information, we can help the team of writers craft more content you care about, which helps us all in the long run. As a small but growing team, discovering software such as CoSchedule can help lay the groundwork as we bring on new members and grow the organization. Price points for the software range from a measly $15 per month for a basic package and can expand as your business needs evolve. If you’re a blogger and not sure if CoSchedule is right for you, check out the video below and try out the 14-day free trail. Because the trial doesn’t require a credit card, you have nothing to lose and everything to gain.